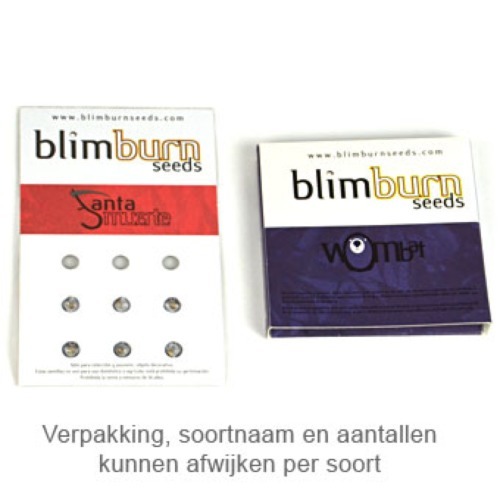 Guanabana from Blimburn Seeds are feminised cannabis seeds that are originated by crossing Amensia Haze x White Widow. The intersection of this well-known cannabis strain delivers a powerful and stable cannabis Sativa plant. This plant won several rewards including the 1st and 2nd place at the Cup Sanferweed of Highlife BCN in 2008 within the Haze category and the 1st reward at the outdoor Uruguayan First Cannabis Cup. Blimburn Guanabana is a reasonably fast growing Sativa plant that is suitable for an indoor and outdoor grow. Because of the many branches with full compact buds these cannabis plants generate a large yield. These cannabis seeds could become very large plants and for this reason you have to keep to growth time short. This strain is recommended to the average experienced grower and this strain will provide you a very good harvest. The effect of smoking this cannabis is mainly a mental high. This strain has a powerful taste with fruity influences. We recommend these feminised cannabis seeds to every Sativa lover! Tell us and our customers what you think of the Guanabana from Blimburn Seeds.